There are just 5 days until the game and 3 Kittens has just a few tickets remaining. Please call if you need game tickets, only $20 for your game ticket & a special Twins Tote filled with goodies. 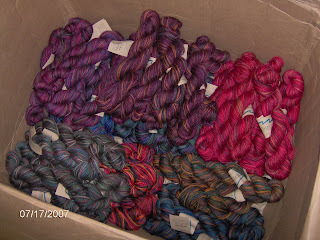 We also have Dome Dollars for sale – good way to save $ on the hot dogs!! If you are up early tomorrow, Wednesday, July 18, tune in to KARE 11 Sunrise show at 5AM and see our very own Laura, along with a couple other shop owners, promoting the upcoming event. 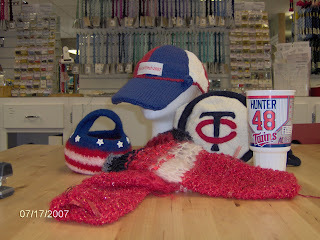 The Twins take on the LA Angels at the Metrodome, this Sunday, July 22 at 1:10PM, with over 300 knitters cheering on the home team! 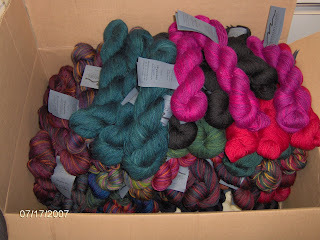 Our Fall order from Mt.Colors has arriived – Stop by and see all the yummy new colors & yarns!